All the words fail in explaining the intolerableness of passing from writing with Hrant Dink to writing for the memorial of Hrant Dink. There is nothing change in my feeling within six years passed from his murder. On the other hand, while life is flowing, to continue his fight for peace is on my shoulders now as the biggest heritage. This article, like most of others, is the expression of that responsibility. The name of Hrant Dink, reverberated in Turkey and in the entire world, as an Armenian journalist who was murdered in front of the building of Agos newspaper in 19th January, 2007. In order to explain the impact of that breaking point requires looking at the ten years period passed from the establishment of this newspaper on his own and what is happening after 2007. Agos, which is the first weekly newspaper of Turkey published in both Turkish-Armenians, was established in April 1996 under the chief editorship of Hrant Dink. That period, to share the ravage, especially the problem of minority foundations in possession of properties and the word of Armenian becoming a swear; which is created by provocative publishing in order to establish a mutual relation between Turkish Armenian Patriarchate and PKK, with the public opinion from the first person, became the main principle of the newspaper. The need to embrace Armenians who could not learn their mother-tongue and who have to immigrate to Istanbul or abroad since there is no Armenian living in Anatolia and no schools to go after 1915, is another purpose in order to establish social solidarity of Turkey's Armenian Society which have to conduct their own schools, Churches and associations economically without taking any financial aid from the government. To share the knowledge and experience of Armenians in these lands in several fields from art to handicrafts was another goal. Like every new institution, first years of establishment of Agos had been passed with seeking and generating an identity. In time, a wide range of agenda items such as; contribution to Turkey-Armenia dialogue, making Armenian Question effable and talkable with a new style which pays regard to the honour, mutual information transfer, freedom of thought and expression and democratization of Turkey within the scope of EU process were included in the goals of the beginning. Such that, in some days, a headline which Hrant Dink stated becomes not only notifying something exists but also determining the agenda of the country. Times when the political challenge was the most tiring and back-breaking, were times when the Governmental actions or discourses of the ultranationalist and chauvinist segment of the community that make Armenians living in Turkey feel alienated reached peak. Armenian proposals in the agendas of the World parliaments and discussions about possessions of Minority Foundations brought the implication of regarding minorities as foreigners with them and the challenge of Hrant Dink was getting hotter. At this point his existence and attitude declared a new Armenian identity. When looking from the perspective of Turkey, the attitude towards Armenian was limited with certain frames. For some people, Armenian is a human type of whom absence is remembered with shortsighted nostalgias like "They cook so nice dolma and topik. They were handicraftsmen" but the reason of their absence has not been examined. For some other segments of society, they were "potential traitors and internal focal points". Hrant Dink, firstly, presented the Armenian concept as an undeniable truth with his own body and voice. Turkey Armenians /Being an Armenian in Turkey became visible and apparent firstly with him. Hrant Dink made an equivalent effort to being a citizen in Turkey as the same effort made to being an Armenian. He never gave up from generating ideas and making a great effort to the future of the country in where he was born as a citizen of The Republic of Turkey. For him, democracy was something to be created by making great effort. He contributed to countless problems and questions such as Kurdish question, head-scarf / turban problem, Turkey-EU relations by starting from his experiences because he deemed this contribution as the requirement of his democracy ethic. Business and Life Ethics of Hrant Dink sided with talking everything in its own environment. Therefore, he never takes problems of Turkey Armenians to Europe as a complain factor although he did not have so many other opportunities. At that point, the words always belonged to his identity of being a citizen of Turkish Republic. Therewithal, in the idea struggle he made with Diaspora, he invited Armenians abroad to a honest face-off by saying that “Do you side with the recognition of the genocide or the democratization of Turkey?" According to him, Armenian Question could only be duly discussed in a society in which the information could be freely distributed and which could be actually democratized in real terms. Therefore, with those draft processes patronizing from outside based on history, it was impossible to have any result other than triggering ultranationalist cheuvanist segments. Fort he very reason, Hrant Dink passionately expressed that all European Countries have to inlude Turkey to the EU process. He was always a follower of demands that increase from the bottom to the top and concern internal dynamics and he had no concern other than democratization of his country. Talking over not only deaths but also the surviving. Hrant Dink wrote the news containing the assertions about the fact that the goddaughter of Atatürk Sabiha Gökçen could be Armenian origin, as an opportunity to discuss the Armenian taboo over deaths but the surviving. This publication was an occasion for him to make the fact, which there are also Armenians who could survive by changing religion, being adopted or married besides those who were died in that sorrowful period, talkable. But he was announced and declared as a “Turkophobe” with a sentence which was picked from the article of General Staff suggesting Diaspora Armenians to give up anti-Turkish attitude and its harsh reprobation letter that was published just after the news hit the headlines of newspaper called Hürriyet; and an anti-campaign which started in company with the important columnists of radical right-winger press and national newspapers put his name to a course which was a real suppression for himself. Hrant Dink, who devoted his life to overcome this prejudice, to break the walls of virulence and for Turkish and Armenian societies understood and know each other, was not actually murdered in 19th January, 2007. He was murdered when he was threatened by members of National Intelligence Service in the Governorship of Istanbul just after the letter of General Staff. He was murdered when he wasted his breathe in every text, every conversation and felt himself obliged to explain himself again and again. 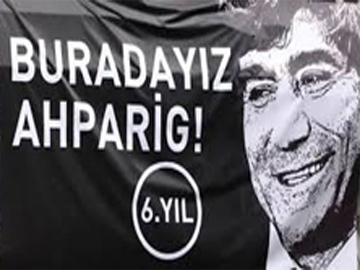 He was murdered when Grey Wolves were shouting “Hrant Dink is the target of all our anger and hatred then” in front of the building of Agos and when courts condemned him despite of the experts’ report and when the Supreme Court of Appeal did not consider harmful to approve this sentence. Two days after the murder, Istanbul Security Director suddenly explained that the murder did not tie in with any organization and did not have any political dimension. There were some video images in which the murder suspect stroke a pose with gendarmeries and polices in front of a poster with a Turkish flag after he was caught in Samsun, revealed. It was understood that, Erhan Tuncel, who is known as one of the planners of Hrant Dink assassination, report the murder to the police in February 2006 that Hrant Dink would be murdered by Yasin Hayal and Trabzon Security Directorate reported this situation to General Directorate of Security Affairs in Ankara. The governor of that period was elected as a Parliamentarian from the ruling party, then promoted as the Minister of Internal Affairs, The Security Director of Istanbul was promoted as the Governor and Mehmet Nihat Ömeroğlu, one of the 18 Supreme Court Judges who have his signature under the penalty fined from the Article 301 of Turkish Criminal Law that regulated the penalty of “insult to Turkishness” of Dink , was promoted as Ombudsman in General Assembly of TGNA. The scale of this organization, is the scope of the country from now on. Deleted telephone conversations, spoiled evidences, hidden documents and destructed reports alternated each other. Currently no investigation conducted on the whole officers to whom the State Supervisory Council recommended to be investigated from the police to gendarmerie, from the security intelligence to judgment and politics. Hence, the case was tried to be closed by condemning those two victims in 17th January, 2012 without finding out the real and actual perpetrators, actors of the murder whoever responsible. Against this legal scandal and the sorrow of the loss, the only hope is the fact that hundred of thousands people bid farewell to Hrant Dink by yelling as "All of us are Armenians" in the funeral after 4 days from the murder, in 23rd of January. In the intervening years, the indignation against what experienced on behalf of his name and personality, increased incrementally. Now the public conscious is following the objection made to the court decision as "there is an organization" made by Supreme Court of Appeals Prosecutor's Office. Now, public stares at the Supreme Court of Appeal as what shall be arrested in the name of “organization”. The scale of this organization is the scope of this country from now on. Our living space is also in size of this scale. In passing 6 years, Turkey community perceived the “message” regarding the 1915 taboo that is intended to be given in the personality of Hrant Dink and stroke an attitude at the point of breaking that taboo and building the peace. My conscience does not agree, I scruple about the fact that a group consists of faculty members and journalists deny and deaf to “the Disaster to which Ottoman Armenians were exposed in 1915”. The petition campaign, which was started in 14th December 2008 with the words of “I deny this injustice and personally, I share all feelings and sorrows of my Armenian brothers and sisters and apologize from them on my on behalf", created tremendous expression with the list of 30.837 people. If words of Prime Minister Recep Tayip Erdoğan about the campaign “Probably they carried out such a genocide, so they apologize. Republic of Turkey has not such a problem” is remembered, it shall be better understood how behind the state politics are from the community. April 24 Commemoration of the Genocide events which were started to happen in Turkey in recent is another expression of that broken paradigm. Ones who looked at black-and-white photos, understood that 220 Armenian intelligent were taken to their last journeys, to their deaths towards Ayaş and Çankırı, just before a huge Anatolian community were relegated to their paths of death with their children, women and elders; in order to prevent them from sharing what all those lived. Commemorations overflowed to squares. While 2015 is coming; facing with Armenian genocide imposes itself as the concept which must be the actual base of the Kurdish Question. Those protocols which were signed in 2009 and estimated that the Turkey-Armenia border to be opened and the diplomatic relations to be started, are still on the shelf! Both today and yesterday are locked. Whereas, the community is ready to pass over that threshold. Because the peace and the welfare of the society are linked to this dearie, only hope of peace. There is no other option than holding on that hope. The heritage of Hrant Dink insists hope and challenge to us at most.